The 1980 incarnation of Orchestral Manoeuvres in the Dark would never have imagined the awesome number of electronic acts actively working and putting out music in 2017. Going on from that thought, it isn’t surprising that OMD found themselves returning to their roots for inspiration for 2013’s ‘English Electric’. Everything comes around full circle, as the saying goes. The title ‘The Punishment of Luxury’ comes from an 1891 painting by Italian artist Giovanni Segantini, incidentally now owned by the Walker Art Gallery in Liverpool. Bassist and most frequent frontman Andy McCluskey has explained, “Most people in the western world are materially better off than their predecessors ever were, and yet we are unhappier. Now we have many possessions that we don’t need because we’ve been persuaded to buy. This is the punishment of luxury.” Seems apt that they’ve undertaken an even further stripping down to their electronic basics for this newest record, eh? And OMD have taken to this challenge like a duck to water. The LP manages to sound fresh and wonderfully experimental at the same time, which is no mean feat. Inventive single ‘Isotype’, unveiled in May, has a relentlessly catchy rhythm while McCluskey questions society’s overreliance on technology and how it’s affecting how we communicate. Recall that this is a band not shy to get philosophical. On ‘Robot Man’, it’s hard to tell whose side he’s on, as he’s joined by mechanical beats, buzzes and flourishes: “in the head, you’re the perfect machine / there’s a hole where your heart should have been”. Speaking of robots, OMD sound like they’re accompanied by their metal buddies on ‘As We Open, So We Close’. Repetitive clicks and swishes hit you in the face while a nursery rhyme-like melody plays on. They dump conventional vocals entirely by feeding the words of ‘Art Eats Art’ through a synth. The result is a memorably frenetic tune. Who needs flying cars when we’ve got a new OMD record? Keyboardist Paul Humphreys takes on vocal duties on the ballad-leaning ‘What Have We Done’. An admirable computerized symphonic sound envelops the track, with synths replacing what might have been strings with any other band. Don’t forget these are the guys who pioneered New Wave synthpop straight out of the gate with their debut single. They’re not afraid to do something different. On the more conventional side of things, ‘One More Time’ is as mainstream as this LP gets. As deathly precise synth beats bounce, McCluskey wistfully recalls, “I’ve never heard a woman call out my name / with the love and the power and passion that you gave / hold me in your arms and say you’re mine / you can break my heart one more time”. It’s like a nice continuation of ‘If You Leave’ some 30 years later. An even more compelling story is told through ‘Ghost Star’, an over 6-minute opus that begins with arresting organ chords and bird calls. McCluskey’s softly sung words like “the broken boy is healed again / I fall into you wholly” fall away softly and before a meticulously exquisite electronic melody and beat sequence follows. The lyrics alone could stand as a beautiful poem, but spun with OMD’s instrumentation, the overall effect is spellbinding. It bears repeating that good stuff always remains good stuff. In an age where OMD are surrounded by youngsters clutching synths, inspired by their ‘80s output, they could have simply rested on their laurels and repeated the same old schtick. Instead, they’ve come out 4 decades from their start with an interesting set of songs, running the gamut from high-tech experimental to poppy torch song, and sure to inspire a new generation. 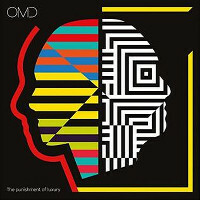 OMD’s ‘The Punishment of Luxury’, their thirteenth album, will be out this Friday, the 1st of September, on White Noise and 100% Records. To catch up on our coverage here on TGTF, which includes live reviews of them stateside and in England, go here.